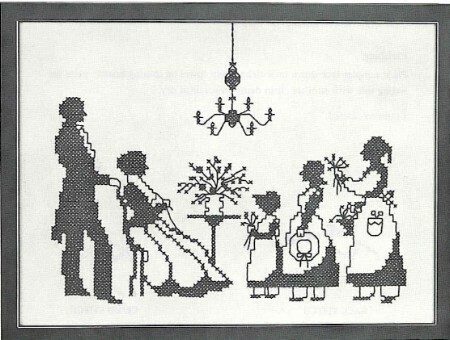 This cross stitch stamped sampler craft kit depicts a Colonial era in silhouette.A cross stitch printed sampler with parents being presented with garden gifts by their daughters is an exciting scene from yesteryear to show on your wall. Since this is a silhouette and is sewn in black it makes for a fast enjoyable project. Love it. Looks good framed and I ordered the whole series for my guest room.